In 2014, the Michigan legislature approved Governor Snyder’s Regional Prosperity Initiative. The initiative encourages local private, public, and non-profit partners to work collaboratively to create vibrant regional economies. The initiative divided the state into 10 regions. 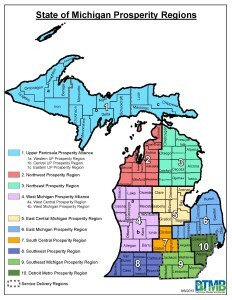 Region 4, the West Michigan Prosperity Alliance (WMPA), includes 13 counties in West Michigan (see map to the right). WMPA received State funding in 2014 to support projects that address regional economic issues. Map of watersheds in Region 4. The project’s overall goal is to advance implementation of US Environmental Protection Agency and Michigan Department of Environmental Quality (DEQ) approved watershed management plans. The purpose of the regional initiative is to establish sustainable funding opportunities beyond what is available through competitive grant programs. Doing so will ensure that existing water quality management plans do not become outdated and that implementation is timely, cost-effective and sustainable and organizations overseeing this work are able to retain quality staff. .